Have they been in business for a substantial period of time? Less reliable roofers will come and go quickly. Dependable roofing contractors have been around for years, and can point to a large number of former clients as references. Are they affiliated with a respected name in the roofing industry? Roofing contractors that affiliate themselves with nationwide roofing companies have been screened and shown to be worthy of carrying that company’s name, a sign they can be trusted. At ABC Seamless Home Specialists, we have served homeowners in and near Madison, WI, since 1975, so we have a long track record of quality customer service. We install products from ABC Seamless – one of the leading names in the home improvement industry, with a nationwide reputation for excellence. We’re especially proud to be one of the only roofing contractors in Wisconsin to install seamless steel roofing materials from ABC Seamless. Made from 28-gauge steel, our seamless roofs connect using a dependable four-way interlocking system that is guaranteed to hold tight even in winds up to 160 mph – the equivalent of an F-3 tornado. 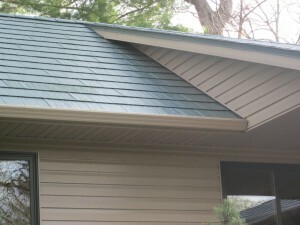 The result is a veritable helmet of steel that will shield your home from hail and wind-blown debris for years to come. To learn more about how we compare to other roofing contractors, or to receive a free quote on your project in or near Madison, WI, contact ABC Seamless Home Specialists today.